You have just been rear-ended. Except for a minor pain in the neck, you seem to be okay. The next morning, however, you wake up with pain in your head and neck, and when you try to sit up, you feel intense pain and lightheadedness. What you are experiencing are the symptoms of whiplash- an injury in which the neck is "whipped" in a rapid backward motion as the car lurches ahead, followed by a rapid forward motion as the seat belt grabs you and the car slows down. Someone is involved in an automobile collision every five seconds. A person suffering whiplash may not realize the extent of the injury for some time. In fact, research shows that days to weeks to months may elapse before pain presents itself. Common symptoms following whiplash are neck pain and stiffness, upper back pain, headaches, mid-back and lower back pain, pain and weakness of the arms/legs, dizziness, jaw pain (TMJ), hearing or visual changes and difficulty swallowing. What happens to the neck during a rear end collision? The neck is upright before the collision. Immediately after the impact, the car seat pushes the torso forward while the head remains stationary. At the same time, the torso "ramps" up the seat, compressing the cervical spine. The spine forms an S-shaped curve at about 75 milliseconds into the collision before the musculature of the neck has a chance to react. An S-shaped curve results and causes a sharp bending in just a few spinal segments. After the sharp bending occurs, the spine fully extends (head goes backward). Historically, this is the point where most scientists thought injury occurred. The latest study on this issue shows that the joint capsule of a few segments of the cervical spine undergoes such excessive stress that the joint capsules can be torn or the cartilage in the joint itself can be "pinched," resulting in tissue damage and pain. Symptoms become maximal within 24-72 hours. There is much research showing that symptoms may be delayed from days to months or years. Heat and rest at home will relieve the symptoms with resolution occurring in a progressive fashion, leaving no residuals. It is not true in most cases of whiplash that heat and rest at home will relieve symptoms. There will be no residual symptoms after whiplash. This could not be further from the truth. Over the last 36 years, there have been dozens of papers written on the long-term prognosis of whiplash trauma. These studies show that the prognosis for full recovery hovers around only 54-61%. The follow-up periods in these studies ranged from 1 to 10 years. A 1993 paper based on the long-term outcome of whiplash trauma found that after more than 10 years, 86 percent of the subjects were still symptomatic. It is important to understand the commonly accepted classification of the inflammatory response. It is divided into 3 phases. Phase I - acute inflammatory phase- lasts up to 72 hours. Phase II- repair phase- lasts from 48 hours to 6 weeks. Phase III- remodeling phase- lasts from 3 weeks to 12 months or more. Thus, symptoms may last for 1 year or more.Both ligaments and muscles are weaker after healing from a whiplash type strain/sprain. Healing of ligaments, muscles, and other soft tissues occurs with fibrous repair (scar tissue) rather than by regeneration of damaged tissue. Healed ligaments contain immature type III collagen which is deficient in cross-links and the quantity of fibers is less than in normal ligaments which are composed chiefly of type I collagen. Muscle is made weaker, less elastic, less pliable, and often more sensitive by scar formation. A low speed collision causes little to no harm to the occupant(s) of the vehicle. The speed of the vehicles involved and the amount of damage to the vehicles is often called to question. Federal motor vehicle safety standards mandate that all cars sold in or imported to the U.S. have either a 2.5 or 5 mph bumper. That means that these cars must withstand a collision at these speeds with a fixed barrier. What happens when two cars, each equipped with 5 mph bumpers, collide at 9 mph? They would very likely be able to absorb the energy without any apparent permanent damage. Much of this energy has been shown to be transferred directly to the occupant, hence the soft tissue injury. Insurance industry funded crash testing has shown that 5 mph is the real threshold for cervical strain. Forces generated in whiplash trauma are surprisingly high. One G is the acceleration due to the earth's gravity. Typically, it is described at 9.81 m/sec2or 32 ft/sec2. In studies, forces sustained by both humans and dummies in rear impact collisions were shown to be 2 1/2 times the forces sustained by the vehicle. In other words, the occupant of the vehicle was exposed to greater acceleration and deceleration forces than was the vehicle itself. These findings were confirmed in 1989. It was measured the maximum peak acceleration to the head of human volunteer exposed to nominal 10 G accelerations to be at 47.8 G. It was measured cranial accelerations of 40-50 G and tractional forces at C1 of 1600-2000N in cadavers exposed to an acceleration to 10 mph as well. Patients injured in whiplash accidents develop spondylosis approximately six times more frequently than age and gender-matched controls. Researches have found that patients with pre-existing spondylosis generally fared worse in whiplash injuries. The incidence of loss or reversal of the normal lordosis in the asymptomatic, atraumatic population is only 9%. While it is true that seatbelts and shoulder harnesses have decreased the number of fatalities and serious facial and chest trauma, they have significantly increased the number of sometimes disabling cervical injuries. Chiropractic experts in the field of whiplash recommend early manipulative intervention with treatment daily during the first one to three weeks. Treatment may then be performed on an every other day basis. It is not true that chiropractic manipulation performed more than 3 times per week will cause injury. Just the opposite; early, regular care will allow more expedient healing. 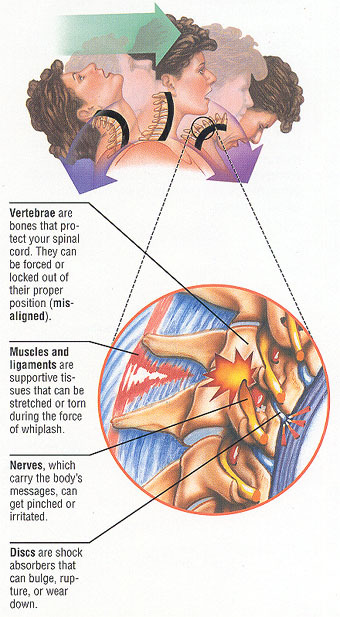 Whiplash is when the soft tissues of the neck are injured by a sudden jerking or "whipping" of the head. This type of motion strains the muscles and ligaments of the neck beyond their normal range of motion. When a vehicle stops suddenly in a crash or is struck from behind, a seat belt will keep a person's body from being thrown forward. But the head may snap forward, then backward, causing whiplash. You may feel pain and stiffness in your neck for the first few days following a whiplash injury. Then you feel better, but the pain and stiffness may come back several days later. The discomfort you feel may involve surrounding muscle groups in your head, chest, shoulders, and arms. Try over-the-counter pain relievers like aspirin, acetaminophen, or ibuprofen. For at least 2 to 3 weeks, avoid activities that bring on or worsen your pain and stiffness. Don't lift or carry anything heavy or participate in sports. If you have pain when you move your head or the pain involves your shoulders or arms, your doctor may recommend a soft neck collar or short-term prescription drug to relax the muscles. Neck pain and stiffness comes back after it had resolved. The pain spreads to your shoulders or arms. You have pain when you move your head. You have numbness, tingling, or weakness in your arms. Headrests in your car can reduce the severity of neck pain from a car accident. Make sure that the headrest is positioned properly for your height. If you do get whiplash, learn proper stretching exercises once your neck has healed. This reduces the chance that neck pain or stiffness will come back. If you are involved in a road accident and think you have sustained a whiplash injury, the first thing you should do is call the police. After collecting all the details you need from the other party and any witnesses, go to your GP or the Accident and Emergency unit depending on the severity of your injury. Most people will not notice symptoms of whiplash immediately. It generally takes a day or two for the symptoms to show and they will get worse over a few days before they begin to get better. Using an ice pack can bring any swelling down and painkillers provided by your GP will help with any pain you may be feeling. Usually GP’s will recommend you rest your neck and gradually start introducing some exercises to help the recovery process. After receiving treatment, phone an injury claims company who will put you in touch with an experienced whiplash injury lawyer. It is important to make a claim if you have sustained a whiplash injury as it is not only painful and uncomfortable but some individuals can suffer from the affects for months and even years. The injury is the most common caused by a motor traffic accident and if that accident was not your fault you should make a personal injury compensation claim. The details you collected from the scene of the accident will then be given to your injury lawyer to prove the accident was not your fault. If you are planning to claim your expenses for your injury such as prescription costs then you should keep your receipts as proof. Remember there are strict time limits in place for making a claim so make sure you get in contact with an injury lawyer as soon as you suspect you have suffered a whiplash injury which was caused by an accident that was not your fault. If you are successful in your claim then you will receive a sum of money to help with your recovery and compensate you for your pains and the inconvenience the accident and injury caused you.